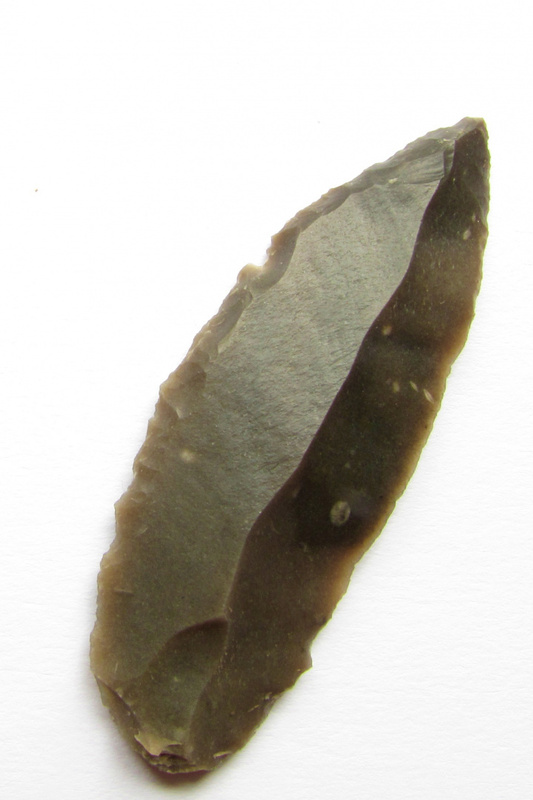 This is a wonderful 7,3 cm long Châtelperronien Point from the Brive vicinity, made from "silex jaspoïde de l'Hettangien from Puy- d'Arnac", which was often used during the Paleolithic of the Brive region since the Middle Paleolithic ("Chez-Pourré-Chez-Comte" ). It comes from a late 19th century collection and may be from the Grotte de Bos -les-Ser. More about the Châtelperronian - see here 1492 . Today the Corrèze is a department in south-western France, named after the river Corrèze which runs though it. Its capital is Tulle, and its most populated town is Brive-la-Gaillarde. The department is part of the region of Nouvelle-Aquitaine. It is surrounded by the departments of Creuse, Haute-Vienne, Cantal, Puy-de-Dôme, Lot, and Dordogne. Upper Paleolithic habitations near Brive is particularly concentrated in and near the Planchetorte Valley 3 km south of Brive, a small stream which runs north to join the Correze River just above its confluence with the Vezere. The Planchetorte Valley, often little more than 200 m wide is a Vezere valley in miniature, lined with caves and rock shelters eroded into local Triassic sandstone. Most of these localities were excavated during the early 20th century by the Abbès Jean and Amèdèe Bouyssonie aided often by their pupils at the Ecole Bossuet. Little care was made to establish a proper stratigraphy and after the excavations, Archaeological material from different “foyers” was usually lumped together, creating a mix, that can only reconstructed by typology. Anyhow there are ensembles from rare Châtelperronian and Aurignacian occupations and a more intense settlement during the Noaillian / Rayssian and Magdalenian. We will describe some of these sites, having in mind what was lost during the early Years of Prehistoric reserch. Grotte de Bos -les-Ser A mix of excellent Châtelperronian-points and Aurignacian tools (Lamelles Dufour, Carinated tools), that were found within a homogeneous geological stratum of 40 cm thickness, as reported by the Bouyssonie brothers. Le-Puy-de-Lacan : three strata of Magdalenian. The lower strata with triangles indicating an early and middle Magdalenian and the upper strata are characterized by a specific burin, whose proximal end is modified into a long tip by a concave retouch. Font Robert The site was excavated 1905 by M Pierre, the "vieux domestique" of the Thévenard family, at this time proprietors of the near Bassaler castle. The archaeological horizon, was said to be 20 cm thick, according to the excavators (M Pierre and Mdm Thévenard). Typologically we see a mix of Aurignacian, early Gravettian with the famous eponymous points and Noailles burins. David N.C.: Excavation of the abri Pataud, Les Eyzies (Dordogne): the Noaillian (level 4) assemblages and the Noaillian culture in Western Europe. American School of Prehistoric Research, Peabody Museum, Harvard University, 37, 1985, 355 f.